... is what the noxious poison of racial tribalism is doing to us. What are we without thinking? What are we without learning? How do we differ from the animals if all we need to solve is how to eat, how to mate and how to survive? It's considered racist to discuss apes and blacks in the same sentence. 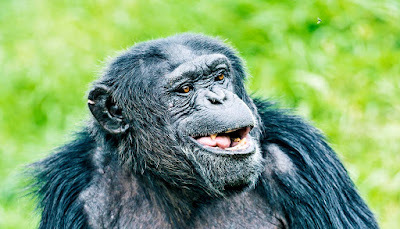 Forget blacks, apes are what we all become when we succumb to the cult of racialism, whether it's led by Ta-Nehisi Coates and Kamala Harris or Richard Spencer. You, when you intellectually group people by race. Think about what it means to criticize members of a certain race when they deviate from the cult's accepted opinions, like what has happened to Kanye West and Candace Owens. The logic goes like this. Holding a different opinion than the cult makes you a traitor to the race. If your opinions are given to you by the cult, there's no need to think as the end result is predetermined. If there's no reason to think, there's no reason to learn. Why waste time informing yourself when that information isn't going to change anything? Instead of reading, listening or discussing, you might as well pick at lice, you pathetic ape. If this was where we were going to end up in the wealthiest, most powerful nation in the history of the world, why did we bother inventing writing in the first place? We might as well have just remained chimpanzees, beating the daylights out of each other in the forest.